The Line is a colorful design-driven hotel set in the heart of LA’s buzzing Koreatown. 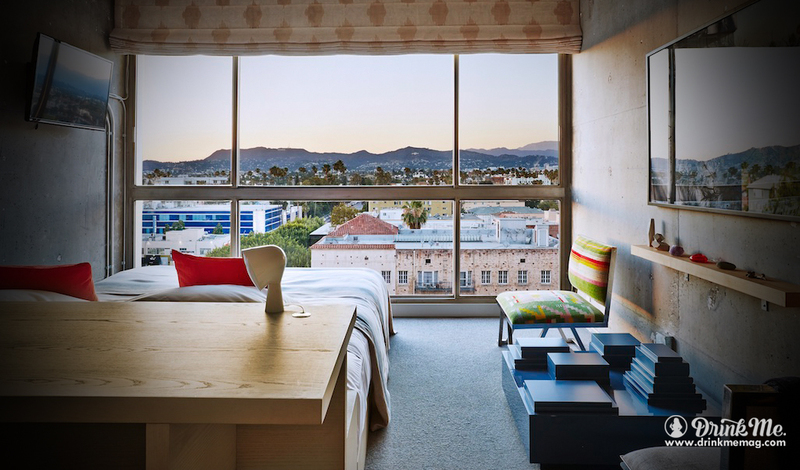 Boxy guest rooms are smartly-designed with a centerpiece bed and a floor-to-ceiling window-wall that overlooks the city and Hollywood sign. Take advantage of the sunny second floor pool deck that sits next to the stunning (AC-cooled) greenhouse restaurant The Commissary. LA son Roy Choi oversees the food & beverage program with three eateries and a fun lobby bar that’s festooned with Mexican prayer candles and mylar balloons that spell out “POT BAR”. Choi tapped local cocktail-chef Matthew Biancaniello to craft the food-friendly –and food-infused –drink list. Try a soju cocktail infused with kimchi, fermented tofu, or curry before heading to dinner at Pot, the cheekily-named Korean hot pot restaurant.